Figure 3.3. Change in average annual runoff by the 2050s under the SRES A2 emissions scenario and different climate models (Arnell, 2003a). Figure 3.4 shows the mean runoff change until 2050 for the SRES A1B scenario from an ensemble of twenty-four climate model runs (from twelve different GCMs) (Milly et al., 2005). Almost all model runs agree at least with respect to the direction of runoff change in the high latitudes of North America and Eurasia, with increases of 10 to 40%. This is in agreement with results from a similar study of Nohara et al. (2006), which showed that the ensemble mean runoff change until the end of the 21st century (from nineteen GCMs) is smaller than the standard deviation everywhere except at northern high latitudes. With higher uncertainty, runoff can be expected to increase in the wet tropics. Prominent regions, with a rather strong agreement between models, of decreasing runoff (by 10 to 30%) include the Mediterranean, southern Africa, and western USA/northern Mexico. In general, between the late 20th century and 2050, the areas of decreased runoff expand (Milly et al., 2005). Figure 3.4. Change in annual runoff by 2041-60 relative to 1900-70, in percent, under the SRESA1B emissions scenario and based on an ensemble of 12 climate models. Reprinted by permission from Macmillan Publishers Ltd. [Nature] (Milly et al., 2005), copyright 2005. 2002a, b; Christensen et al., 2004; Dettinger et al., 2004; Hayhoe et al., 2004; Knowles and Cayan, 2004; Leung et al., 2004; Payne et al., 2004; Stewart et al., 2004; VanRheenen et al., 2004; Kim, 2005; Maurer and Duffy, 2005), central North America (Stone et al., 2001; Jha et al., 2004), eastern North America (Frei et al., 2002; Chang, 2003; Dibike and Coulibaly, 2005), the entire Russian territory (Shiklomanov and Georgievsky, 2002; Bedritsky et al., 2007), and Scandinavia and Baltic regions (Bergström et al., 2001; Andreasson et al., 2004; Graham, 2004). The effect is greatest at lower elevations (where snowfall is more marginal) (Jasper et al., 2004; Knowles and Cayan, 2004), and in many cases peak flow would occur at least a month earlier. Winter flows increase and summer flows decrease. 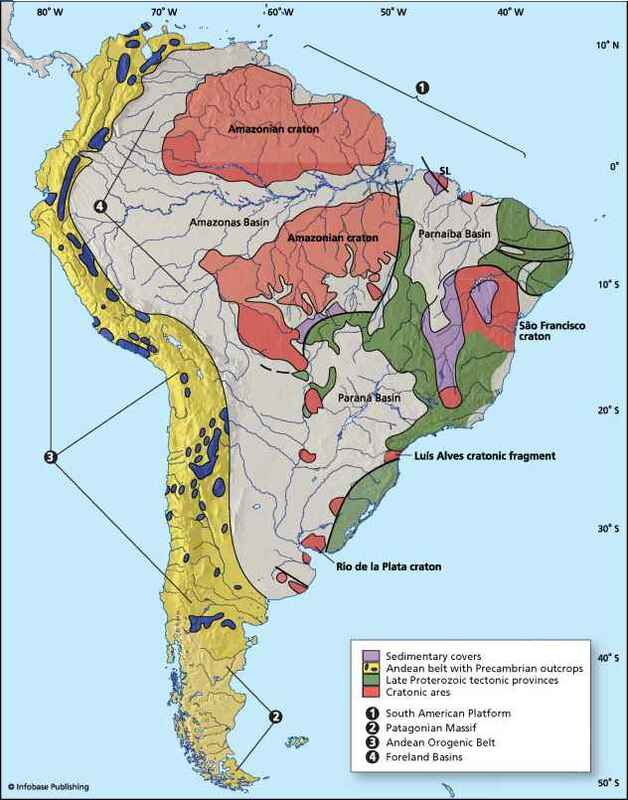 Many rivers draining glaciated regions, particularly in the Hindu Kush-Himalaya and the South-American Andes, are sustained by glacier melt during the summer season (Singh and Kumar, 1997; Mark and Seltzer, 2003; Singh, 2003; Barnett et al., 2005). Higher temperatures generate increased glacier melt. Schneeberger et al. (2003) simulated reductions in the mass of a sample of Northern Hemisphere glaciers of up to 60% by 2050. As these glaciers retreat due to global warming (see Chapter 1), river flows are increased in the short term, but the contribution of glacier melt will gradually decrease over the next few decades. In regions with little or no snowfall, changes in runoff are dependent much more on changes in rainfall than on changes in temperature. A general conclusion from studies in many raindominated catchments (Burlando and Rosso, 2002; Evans and Schreider, 2002; Menzel and Burger, 2002; Arnell, 2003b, 2004a; Boorman, 2003a; Booij, 2005) is that flow seasonality increases, with higher flows in the peak flow season and either lower flows during the low flow season or extended dry periods. In most case-studies there is little change in the timing of peak or low flows, although an earlier onset in the East Asian monsoon would bring forward the season of peak flows in China (Bueh et al., 2003). Changes in lake levels are determined primarily by changes in river inflows and precipitation onto and evaporation from the lake. Impact assessments of the Great Lakes of North America show changes in water levels of between -1.38 m and +0.35 m by the end of the 21st century (Lofgren et al., 2002; Schwartz et al., 2004). Shiklomanov and Vasiliev (2004) suggest that the level of the Caspian Sea will change in the range of 0.5 to 1.0 m. In another study by Elguindi and Giorgi (2006), the levels in the Caspian Sea are estimated to drop by around 9 m by the end of the 21st century, due largely to increases in evaporation. Levels in some lakes represent a changing balance between inputs and outputs and, under one transient scenario, levels in Lake Victoria would initially fall as increases in evaporation offset changes in precipitation, but subsequently rise as the effects of increased precipitation overtake the effects of higher evaporation (Tate et al., 2004). Increasing winter temperature considerably changes the ice regime of water bodies in northern regions. Studies made at the State Hydrological Institute, Russia, comparing the horizon of 2010 to 2015 with the control period 1950 to 1979, show that ice cover duration on the rivers in Siberia would be shorter by 15 to 27 days and maximum ice cover would be thinner by 20 to 40% (Vuglinsky and Gronskaya, 2005). Model studies show that land-use changes have a small effect on annual runoff as compared to climate change in the Rhine basin (Pfister et al., 2004), south-east Michigan (Barlage et al., 2002), Pennsylvania (Chang, 2003), and central Ethiopia (Legesse et al., 2003). In other areas, however, such as southeast Australia (Herron et al., 2002) and southern India (Wilk and Hughes, 2002), land-use and climate-change effects may be more similar. In the Australian example, climate change has the potential to exacerbate considerably the reductions in runoff caused by afforestation. Carbon dioxide enrichment of the atmosphere has two potential competing implications for evapotranspiration, and hence water balance and runoff. First, higher CO2 concentrations can lead to reduced evaporation, as the stomata, through which evaporation from plants takes place, conduct less water. Second, higher CO2 concentrations can lead to increased plant growth and thus leaf area, and hence a greater total evapotranspiration from the area. The relative magnitudes of these two effects, however, vary between plant types and also depend on other influences such as the availability of nutrients and the effects of changes in temperature and water availability. Accounting for the effects of CO2 enrichment on runoff requires the incorporation of a dynamic vegetation model into a hydrological model. A small number of models now do this (Rosenberg et al., 2003; Gerten et al., 2004; Gordon and Famiglietti, 2004; Betts et al., 2007), but are usually at the GCM (and not catchment) scale. Although studies with equilibrium vegetation models suggest that increased leaf area may offset stomatal closure (Betts et al., 1997; Kergoat et al., 2002), studies with dynamic global vegetation models indicate that stomatal responses dominate the effects of leaf area increase. Taking into account CO2-induced changes in vegetation, global mean runoff under a 2XCO2 climate has been simulated to increase by approximately 5% as a result of reduced evapotranspiration due to CO2enrichment alone ('physiological forcing') (Betts et al., 2007; Leipprand and Gerten, 2006). This may be compared to (often much larger) changes at the river basin scale (Figures 3.3, 3.4, and 3.7), and global values of runoff change. For example, global mean runoff has been simulated to increase by 5%-17% due to climate change alone in an ensemble of 143 2XCO2 GCM simulations (Betts et al., 2006). The demand for groundwater is likely to increase in the future, the main reason being increased water use globally. Another reason may be the need to offset declining surface water availability due to increasing precipitation variability in general and reduced summer low flows in snow-dominated basins (see Section 3.4.3). arid regions are replenished by direct infiltration of precipitation into fractures and dissolution channels, and alluvial aquifers are mainly recharged by floods (Al-Sefry et al., 2004). Accordingly, an assessment of climate change impact on groundwater recharge should include the effects of changed precipitation variability and inundation areas (Khiyami et al., 2005). 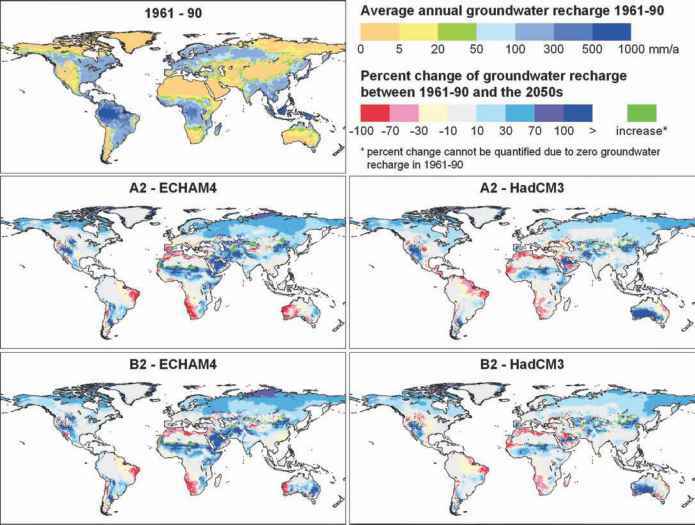 According to the results of a global hydrological model, groundwater recharge (when averaged globally) increases less than total runoff (Doll and Florke, 2005). While total runoff (groundwater recharge plus fast surface and sub-surface runoff) was computed to increase by 9% between the reference climate normal 1961 to 1990 and the 2050s (for the ECHAM4 interpretation of the SRES A2 scenario), groundwater recharge increases by only 2%. For the four climate scenarios investigated, computed groundwater recharge decreases dramatically by more than 70% in north-eastern Brazil, southwest Africa and along the southern rim of the Mediterranean Sea (Figure 3.5). In these areas of decreasing total runoff, the percentage decrease of groundwater recharge is higher than that of total runoff, which is due to the model assumption that in semi-arid areas groundwater recharge only occurs if daily precipitation exceeds a certain threshold. However, increased variability of daily precipitation was not taken into account in this study. Regions with groundwater recharge increases of more than 30% by the 2050s include the Sahel, the Near East, northern China, Siberia, and the western USA. Although rising watertables in dry areas are usually beneficial, they might cause problems, e.g., in towns or agricultural areas (soil salinisation, wet soils). A comparison of the four scenarios in Figure 3.5 shows that lower emissions do not lead to significant changes in groundwater recharge, and that in some regions, e.g., Spain and Australia, the differences due to the two climate models are larger than the differences due to the two emissions scenarios. Figure 3.5. Simulated impact of climate change on long-term average annual diffuse groundwater recharge. Percentage changes of 30 year averages groundwater recharge between present-day (1961 to 1990) and the 2050s (2041 to 2070), as computed by the global hydrological model WGHM, applying four different climate change scenarios (climate scenarios computed by the climate models ECHAM4 and HadCM3), each interpreting the two IPCC greenhouse gas emissions scenarios A2 and B2 (Doll and Florke, 2005). climate change was computed to lead by 2030 and 2100 to a variety of impacts on groundwater recharge and levels, wetlands, water supply potential, and low flows, the sign and magnitude of which strongly depend on the climate model used to compute the groundwater model input (Kirshen, 2002). Climate change is likely to have a strong impact on saltwater intrusion into aquifers as well as on the salinisation of groundwater due to increased evapotranspiration. Sea level rise leads to intrusion of saline water into the fresh groundwater in coastal aquifers and thus adversely affects groundwater resources. For two small, flat coral islands off the coast of India, the thickness of the freshwater lens was computed to decrease from 25 m to 10 m and from 36 m to 28 m for a sea-level rise of only 0.1m (Bobba et al., 2000). Any decrease in groundwater recharge will exacerbate the effect of sea-level rise. In inland aquifers, a decrease in groundwater recharge can lead to saltwater intrusion of neighbouring saline aquifers (Chen et al., 2004), and increased evapotranspiration in semi-arid and arid regions may lead to the salinisation of shallow aquifers. A warmer climate, with its increased climate variability, will increase the risk of both floods and droughts (Wetherald and Manabe, 2002; Table SPM2 in IPCC, 2007). As there are a number of climatic and non-climatic drivers influencing flood and drought impacts, the realisation of risks depends on several factors. Floods include river floods, flash floods, urban floods and sewer floods, and can be caused by intense and/or long-lasting precipitation, snowmelt, dam break, or reduced conveyance due to ice jams or landslides. Floods depend on precipitation intensity, volume, timing, antecedent conditions of rivers and their drainage basins (e.g., presence of snow and ice, soil character, wetness, urbanisation, and existence of dikes, dams, or reservoirs). Human encroachment into flood plains and lack of flood response plans increase the damage potential. The term drought may refer to meteorological drought (precipitation well below average), hydrological drought (low river flows and water levels in rivers, lakes and groundwater), agricultural drought (low soil moisture), and environmental drought (a combination of the above). The socio-economic impacts of droughts may arise from the interaction between natural conditions and human factors, such as changes in land use and land cover, water demand and use. Excessive water withdrawals can exacerbate the impact of drought. A robust result, consistent across climate model projections, is that higher precipitation extremes in warmer climates are very likely to occur (see Section 3.3.1). Precipitation intensity increases almost everywhere, but particularly at mid- and high latitudes where mean precipitation also increases (Meehl et al., 2005, WGI AR4, Chapter 10, Section 10.3.6.1). This directly affects the risk of flash flooding and urban flooding. Storm drainage systems have to be adapted to accommodate increasing rainfall intensity resulting from climate change (Waters et al., 2003). An increase of droughts over low latitudes and mid-latitude continental interiors in summer is likely (WGI AR4, Summary for Policymakers, Table SPM.2), but sensitive to model land-surface formulation. Projections for the 2090s made by Burke et al. (2006), using the HadCM3 GCM and the SRES A2 scenario, show regions of strong wetting and drying with a net overall global drying trend. For example, the proportion of the land surface in extreme drought, globally, is predicted to increase by the a factor of 10 to 30; from 1-3 % for the present day to 30% by the 2090s. The number of extreme drought events per 100 years and mean drought duration are likely to increase by factors of two and six, respectively, by the 2090s (Burke et al., 2006). A decrease in summer precipitation in southern Europe, accompanied by rising temperatures, which enhance evaporative demand, would inevitably lead to reduced summer soil moisture (Douville et al., 2002) and more frequent and more intense droughts. As temperatures rise, the likelihood of precipitation falling as rain rather than snow increases, especially in areas with temperatures near to 0°C in autumn and spring (WGI AR4, Summary for Policymakers). Snowmelt is projected to be earlier and less abundant in the melt period, and this may lead to an increased risk of droughts in snowmelt-fed basins in summer and autumn, when demand is highest (Barnett et al., 2005). With more than one-sixth of the Earth's population relying on melt water from glaciers and seasonal snow packs for their water supply, the consequences of projected changes for future water availability, predicted with high confidence and already diagnosed in some regions, will be adverse and severe. Drought problems are projected for regions which depend heavily on glacial melt water for their main dry-season water supply (Barnett et al., 2005). In the Andes, glacial melt water supports river flow and water supply for tens of millions of people during the long dry season. Many small glaciers, e.g., in Bolivia, Ecuador, and Peru (Coudrain et al., 2005), will disappear within the next few decades, adversely affecting people and ecosystems. Rapid melting of glaciers can lead to flooding of rivers and to the formation of glacial melt-water lakes, which may pose a serious threat of outburst floods (Coudrain et al., 2005). The entire Hindu Kush-Himalaya ice mass has decreased in the last two decades. Hence, water supply in areas fed by glacial melt water from the Hindu Kush and Himalayas, on which hundreds of millions of people in China and India depend, will be negatively affected (Barnett et al., 2005). Under the IPCC IS92a emissions scenario (IPCC, 1992), which is similar to the SRES A1 scenario, significant changes in flood or drought risk are expected in many parts of Europe (Lehner et al., 2005b). The regions most prone to a rise in flood frequencies are northern and north-eastern Europe, while southern and southeastern Europe show significant increases in drought frequencies. This is the case for climate change as computed by both the ECHAM4 and HadCM3 GCMs. Both models agree in their estimates that by the 2070s, a 100-year drought of today's magnitude would return, on average, more frequently than every 10 years in parts of Spain and Portugal, western France, the Vistula Basin in Poland, and western Turkey (Figure 3.6). Studies indicate a decrease in peak snowmelt floods by the 2080s in parts of the UK (Kay et al., 2006b) despite an overall increase in rainfall. Results of a recent study (Reynard et al., 2004) show that estimates of future changes in flood frequency across the UK are now noticeably different than in earlier (pre-TAR) assessments, when increasing frequencies under all scenarios were projected. Depending on which GCM is used, and on the importance of snowmelt contribution and catchment characteristics and location, the impact of climate change on the flood regime (magnitude and frequency) can be both positive or negative, highlighting the uncertainty still remaining in climate change impacts (Reynard et al., 2004). A sensitivity study by Cunderlik and Simonovic (2005) for a catchment in Ontario, Canada, projected a decrease in snowmelt-induced floods, while an increase in rain-induced floods is anticipated. The variability of annual maximum flow is projected to increase. Palmer and Raisanen (2002) analysed GCM-modelled differences in winter precipitation between the control run and around the time of CO2 doubling. A considerable increase in the risk of a very wet winter in Europe and a very wet monsoon season in Asia was found. The probability of total boreal winter precipitation exceeding two standard deviations above normal is projected to increase considerably (even five- to seven-fold) over large areas of Europe, with likely consequences for winter flood hazard. Milly et al. (2002) demonstrated that, for fifteen out of sixteen large basins worldwide, the control 100-year peak volumes (at the monthly time-scale) are projected to be exceeded more frequently as a result of CO2 quadrupling. In some areas, what is given as a 100-year flood now (in the control run), is projected to occur much more frequently, even every 2 to 5 years, albeit with a large uncertainty in these projections. Yet, in many temperate regions, the snowmelt contribution to spring floods is likely to decline on average (Zhang et al., 2005). Future changes in the joint probability of extremes have been considered, such as soil moisture and flood risk (Sivapalan et al., 2005), and fluvial flooding and tidal surge (Svensson and Jones, 2005). Impacts of extremes on human welfare are likely to occur disproportionately in countries with low adaptation capacity (Manabe et al., 2004a). The flooded area in Bangladesh is projected to increase at least by 23-29% with a global temperature rise of 2°C (Mirza, 2003). Up to 20% of the world's population live in river basins that are likely to be affected by increased flood hazard by the 2080s in the course of global warming (Kleinen and Petschel-Held, 2007). Figure 3.6. Change in the recurrence of 100-year droughts, based on comparisons between climate and water use in 1961 to 1990 and simulations for the 2020s and 2070s (based on the ECHAM4 and HadCM3 GCMs, the IS92a emissions scenario and a business-as-usual water-use scenario). Values calculated with the model WaterGAP 2.1 (Lehner et al., 2005b). Higher water temperature and variations in runoff are likely to produce adverse changes in water quality affecting human health, ecosystems, and water use (Patz, 2001; Lehman, 2002; O'Reilly et al., 2003; Hurd et al., 2004). Lowering of the water levels in rivers and lakes will lead to the re-suspension of bottom sediments and liberating compounds, with negative effects on water supplies (Atkinson et al., 1999). More intense rainfall will lead to an increase in suspended solids (turbidity) in lakes and reservoirs due to soil fluvial erosion (Leemans and Kleidon, 2002), and pollutants will be introduced (Mimikou et al., 2000; Neff et al., 2000; Bouraoui et al., 2004). Higher surface water temperatures will promote algal blooms (Hall et al., 2002; Kumagai et al., 2003) and increase the bacteria and fungi content (Environment Canada, 2001). This may lead to a bad odour and taste in chlorinated drinking water and the occurrence of toxins (Moulton and Cuthbert, 2000; Robarts et al., 2005). Moreover, even with enhanced phosphorus removal in wastewater treatment plants, algal growth may increase with warming over the long term (Wade et al., 2002). Due to the high cost and the intermittent nature of algal blooms, water utilities will be unable to solve this problem with the available technology (Environment Canada, 2001). Increasing nutrients and sediments due to higher runoff, coupled with lower water levels, will negatively affect water quality (Hamilton et al., 2001), possibly rendering a source unusable unless special treatment is introduced (Environment Canada, 2004). Furthermore, higher water temperatures will enhance the transfer of volatile and semi-volatile compounds (e.g., ammonia, mercury, dioxins, pesticides) from surface water bodies to the atmosphere (Schindler, 2001). In regions where intense rainfall is expected to increase, pollutants (pesticides, organic matter, heavy metals, etc.) will be increasingly washed from soils to water bodies (Fisher, 2000; Boorman, 2003b; Environment Canada, 2004). Higher runoff is expected to mobilise fertilisers and pesticides to water bodies in regions where their application time and low vegetation growth coincide with an increase in runoff (Soil and Water Conservation Society, 2003). Also, acidification in rivers and lakes is expected to increase as a result of acidic atmospheric deposition (Ferrier and Edwards, 2002; Gilvear et al., 2002; Soulsby et al., 2002). In estuaries and inland reaches with decreasing streamflow, salinity will increase (Bell and Heaney, 2001; Williams, 2001; Beare and Heaney, 2002; Robarts et al., 2005). Pittock (2003) projected the salt concentration in the tributary rivers above irrigation areas in the Murray-Darling Basin in Australia to increase by 13-19% by 2050 and by 21-72% by 2100. Secondary salinisation of water (due to human disturbance of the natural salt cycle) will also threaten a large number of people relying on water bodies already suffering from primary salinisation. In areas where the climate becomes hotter and drier, human activities to counteract the increased aridity (e.g., more irrigation, diversions and impoundments) will exacerbate secondary salinisation (Williams, 2001). Water salinisation is expected to be a major problem in small islands suffering from coastal sea water intrusion, and in semi-arid and arid areas with decreasing runoff (Han et al., 1999; Bobba et al., 2000; Ministry for the Environment, 2001;Williams, 2001; Loáiciga, 2003; Chen et al., 2004; Ragab, 2005). Due to sea-level rise, groundwater salinisation will very likely increase. Water-borne diseases will rise with increases in extreme rainfall (Hall et al., 2002; Hijioka et al., 2002; D'Souza et al., 2004; see also Chapter 8). In regions suffering from droughts, a greater incidence of diarrhoeal and other water-related diseases will mirror the deterioration in water quality (Patz, 2001; Environment Canada, 2004). In developing countries, the biological quality of water is poor due to the lack of sanitation and proper potabilisation methods and poor health conditions (Lipp et al., 2001; Jiménez, 2003; Maya et al., 2003; WHO, 2004). Hence, climate change will be an additional stress factor that will be difficult to overcome (Magadza, 2000; Kashyap, 2004; Pachauri, 2004). Regrettably, there are no studies analysing the impact of climate change on biological water quality from the developing countries' perspective, i.e., considering organisms typical for developing countries; the effect of using wastewater to produce food; and Helminthiases diseases, endemic only in developing countries, where low-quality water is used for irrigation (WHO/UNICEF, 2000). Even in places where water and wastewater treatment plants already exist, the greater presence of a wider variety of microorganisms will pose a threat because the facilities are not designed to deal with them. As an example, Cryptosporidium outbreaks following intense rainfall events have forced some developed countries to adopt an additional filtration step in drinking-water plants, representing a 20 to 30% increase in operating costs (AWWA, 2006), but this is not universal practice. • increased amounts of polluted storm water. In areas where amounts of surface water and groundwater recharge are projected to decrease, water quality will also decrease due to lower dilution (Environment Canada, 2004). Unfortunately, in some regions the use of such water may be necessary, even if water quality problems already exist (see Section 3.2). For example, in regions where water with arsenic or fluorine is consumed, due to a lack of alternatives, it may still be necessary to consume the water even if the quality worsens. It is estimated that at least one-tenth of the world's population consumes crops irrigated with wastewater (Smit and Nasr, 1992), mostly in developing countries in Africa, Asia, and Latin America (DFID, 2004). This number will increase with growing populations and wealth, and it will become imperative to use water more efficiently (including reuse). While recognising the convenience of recycling nutrients (Jiménez and Garduño, 2001), it is essential to be aware of the health and environmental risks caused by reusing low-quality water. In developing countries, vulnerabilities are related to a lack of relevant information, institutional weakness in responding to a changing environment, and the need to mobilise resources. For the world as a whole, vulnerabilities are related to the need to respond proactively to environmental changes under uncertainty. Effluent disposal strategies (under conditions of lower self-purification in warmer water), the design of water and wastewater treatment plants to work efficiently even during extreme climatic conditions, and ways of reusing and recycling water, will need to be reconsidered (Luketina and Bender, 2002; Environment Canada, 2004; Patrinos and Bamzai, 2005). Changes in water balance terms affect many geomorphic processes including erosion, slope stability, channel change, and sediment transport (Rumsby and Macklin, 1994). There are also indirect consequences of geomorphic change for water quality (Dennis et al., 2003). Furthermore, hydromorphology is an influential factor in freshwater habitats. • shifts in land use made necessary to accommodate new climatic regimes. Nearing (2001) used output from two GCMs (HadCM3 and the Canadian Centre for Climate Modelling and Analysis CGCM1) and relationships between monthly precipitation and rainfall erosivity (the power of rain to cause soil erosion) to assess potential changes in rainfall erosivity in the USA. The predicted changes were significant, and in many cases very large, but results between models differed both in magnitude and regional distributions. Zhang et al. (2005) used HadCM3 to assess potential changes in rainfall erosivity in the Huanghe River Basin of China. Increases in rainfall erosivity by as much as 11 to 22% by the year 2050 were projected across the region. Michael et al. (2005) projected potential increases in erosion of the order of 20 to 60% over the next five decades for two sites in Saxony, Germany. These results are arguably based on significant simplifications with regard to the array of interactions involved in this type of assessment (e.g., biomass production with changing climate). Pruski and Nearing (2002a) simulated erosion for the 21st century at eight locations in the USA using the HadCM3 GCM, and taking into account the primary physical and biological mechanisms affecting erosion. The simulated cropping systems were maize and wheat. The results indicated a complex set of interactions between the several factors that affect the erosion process. Overall, where precipitation increases were projected, estimated erosion increased by 15 to 100%. Where precipitation decreases were projected, the results were more complex due largely to interactions between plant biomass, runoff, and erosion, and either increases or decreases in overall erosion could occur. A significant potential impact of climate change on soil erosion and sediment generation is associated with the change from snowfall to rainfall. The potential impact may be particularly important in northern climates. Warmer winter temperatures would bring an increasing amount of winter precipitation as rain instead of snow, and erosion by storm runoff would increase. The results described above which use a process-based approach incorporated the effect of a shift from snow to rain due to warming, but the studies did not delineate this specific effect from the general results. Changes in soil surface conditions, such as surface roughness, sealing and crusting, may change with shifts in climate, and hence affect erosion rates. 7.2%, and 6.2% for A2, B2, and GGal, respectively, the predicted erosion (except for the no-till conservation practice scenario) increased by 18-30% for A2, remained similar for B2, and increased by 67-82% for GGal. The greater increases in erosion in the GGal scenario was attributed to greater variability in monthly precipitation and an increased frequency of large storms in the model simulation. Results indicated that no-till (or conservation tillage) systems can be effective in reducing soil erosion under projected climates. A more complex, but potentially dominant, factor is the potential for shifts in land use necessary to accommodate a new climatic regime (O'Neal et al., 2005). As farmers adapt cropping systems, the susceptibility of the soil to erosive forces will change. Farmer adaptation may range from shifts in planting, cultivation and harvest dates, to changes in crop type (Southworth et al., 2000; Pfeifer and Habeck, 2002). Modelling results for the upper Midwest U.S. suggest that erosion will increase as a function of future land-use changes, largely because of a general shift away from wheat and maize towards soybean production. For ten out of eleven regions in the study area, predicted runoff increased from +10% to +310%, and soil loss increased from +33% to +274%, in 2040-2059 relative to 1990-1999 (O'Neal et al., 2005). Other land-use scenarios would lead to different results. For example, improved conservation practices can greatly reduce erosion rates (Souchere et al., 2005), while clear-cutting a forest during a 'slash-and-burn' operation has a huge negative impact on susceptibility to runoff and erosion. Little work has been done on the expected impacts of climate change on sediment loads in rivers and streams. Bouraoui et al. (2004) showed, for southern Finland, that the observed increase in precipitation and temperature was responsible for a decrease in snow cover and increase in winter runoff, which resulted in an increase in modelled suspended sediment loads. Kostaschuk et al. (2002) measured suspended sediment loads associated with tropical cyclones in Fiji, which generated very high (around 5% by volume) concentrations of sediment in the measured flows. The authors hypothesized that an increase in intensity of tropical cyclones brought about by a change in El Niño patterns could increase associated sediment loads in Fiji and across the South Pacific. In terms of the implications of climate change for soil conservation efforts, a significant realisation from recent scientific efforts is that conservation measures must be targeted at the extreme events more than ever before (Soil and Water Conservation Society, 2003). Intense rainfall events contribute a disproportionate amount of erosion relative to the total rainfall contribution, and this effect will only be exacerbated in the future if the frequency of such storms increases.